Reptiles are cold-blooded vertebrates that evolved from ancestral amphibians about 340 million years ago. Animals that are cold-blooded don't automatically maintain a constant body temperature. They have to lay out in the sun to keep their body heat up. This also means that reptiles don't burn as much energy keeping their body warm and, as a result, they don't have to eat nearly as much food as a similar-sized mammal or other warm-blooded animal. There are many types of reptiles. The main categories are snakes, crocodiles and alligators, turtles, and lizards. Reptiles can be found on every continent except for Antarctica. Turtles are reptiles with a big shell to protect them. The biggest reptile is the salt water crocodile. These reptiles can grow to 2,000 pounds and 12 ½ feet long. Reptiles are born on land and are born with strong instincts, so they are on their own at birth. The world is inhabited by at least 250 species of turtles, 25 species of crocodilians, 5,500 species of snakes and 3,000 species of lizards. Most reptiles are carnivorous and eat insects, other reptiles and small animals. A reptile will eat 30 to 50 times less food than birds and mammals (warm-blooded animals) of a similar size. The fastest reptile is the spiny tailed iguana which can run up to 20 miles per hour. The fastest snake is the Black Mamba. There are a few major differences between reptiles and amphibians. Amphibians go through a larval stage, like the tadpole which turns into a frog. Reptiles don't do this. Also, their skin is different: reptiles have scales for skin, but amphibians have moist, glandular skin. Reptile skin is covered with scales, structures that grow on the animal's outer skin and consist of a hard substance known as keratin which is similar to human hair and fingernails. Scales are replaced every so often through a shedding process in which the entire skin is shed in one piece or flakes off in small pieces. Reptile scales vary in shape, size, texture and colour. Scales help prevent reptiles from losing water through their skin. The leathery or hard shells on their eggs protect the young from drying out while they grow inside the egg. Most reptiles can live their entire lives on land. Some types of reptiles (such as sea turtles) are adapted to living in water, but even these species come onto land to lay their eggs. All reptiles also have lungs, so even those living in water must come to the surface to breathe air. Reptiles are found living in all habitats but are more common in warm, tropical places. Fish and amphibians have evolved with skeletons. Reptiles have developed larger skeletons that can hold larger organs and help them increase in size. The legs of reptiles also evolved to shift to the bottom of the body; that allows reptiles (other than snakes) to pick their bellies off the ground and helps them to move more efficiently. Some turtles can live for more than 100 years. Only a small percentage of snakes are poisonous. Many snakes are constrictors, meaning that they squeeze their prey with their bodies until the animal is dead or immobile. Then they swallow it whole! 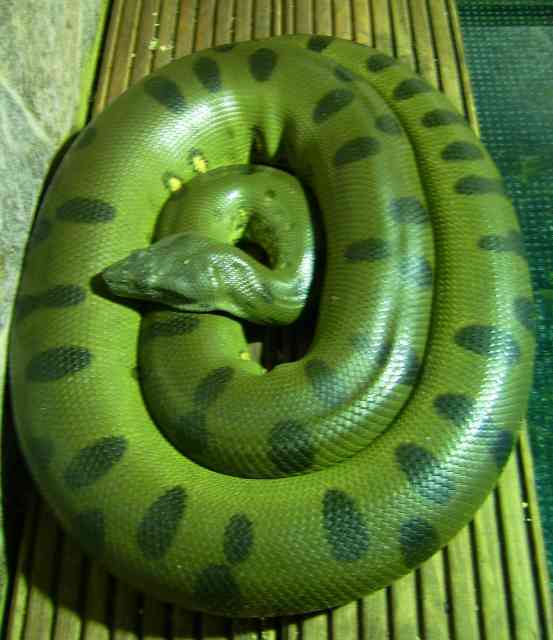 If the meal is large enough, a snake can go weeks or even months without needing to eat again. Reptiles do not belong to a clear group as birds and mammals do. Rather, the ‘Class Reptilia’ consists of four orders which are very different from each other. For example, lizards are more closely related to birds than to turtles! As a result, reptiles are as easily identified by what they aren't as by what they are. Living species of the class Reptilia are placed in four orders. The order Rhynchocephalia contains the lizard-like creatures. Of the four groups of reptiles, the squamates (lizards, snakes and worm-lizards) are the most diverse. There are nearly 7,600 species of squamates, including about 2,900 species of snakes and 4,500 species of lizards. Turtles are the second most diverse group of reptiles, with about 294 species. There are 23 species of crocodilians and 2 species of tuataras. As opposed to mammals and birds, reptiles have neither fur nor feathers, but scales. Reptiles cannot be confused with amphibians because reptiles have dry, water-proof skin and eggs, as well as more advanced bodily systems. Reptiles evolved from amphibians 300 million years ago. There are two characteristics that distinguished early reptiles from amphibians and enabled them to spread and populate more extensively than their ancestors: scales and the ability to lay hard-shelled eggs. Scales protect reptiles (from abrasion and loss of body moisture). Hard-shelled eggs provide a protective environment in which baby reptiles can develop. Reptiles' success as a group is due in large part to their shelled, large-yolked eggs in which the embryo has an independent water supply. This advance helped reptiles to be the first vertebrates to move away from living in the water. They spread out across the landscape, and becoming the dominant life form on our planet during what is known as the age of the reptiles. continent – any of the seven large land masses that constitute most of the dry land on the surface of the Earth. They are Africa, Antarctica, Asia, Australia, Europe, North America, and South America. reptile – an air-breathing cold-blooded egg-laying vertebrate with an outer covering of scales or plates and a bony skeleton, for example the crocodile, tortoise, snake, or lizard. Can you find the hidden turtle in these photographs? At Crocosaurus Cove in Darwin, Australia, you can hold a baby crocodile and even swim with crocs!